The main difference between truth and honesty is that truth refers to the absolute reality of facts whereas honesty is a quality of being sincere and being able to represent ideas in an accurate, convincing manner. Being honest means not telling lies or the quality of presenting their opinions or ideas precisely or most importantly convincingly. However, there is a difference between truth and honesty. For instance, if someone is honest, it doesn’t necessarily mean that the person is completely truthful. These two terms are significant, especially in fields such as law and court systems. Truth refers to a judgment, proposition, or idea that is true or accepted as true. Thus, truth is primarily the accuracy or the absolute reality of facts. It does not necessarily emphasize virtuous qualities as honesty does. Therefore, the truth is the accuracy or the absolute correctness of the facts or the absolute reality of something or someone. Being truthful means actively making known all the full truth of a matter. In a trial, for example, the search for truth is invariably imperfect primarily because the verdict lies in the talent and presentation of the lawyers. And, this is because lawyers can manipulate the truth in a way to defend their clients. Honesty refers to the quality of being honest. The quality of being honest has a wide scope of human virtues such as not lying, stealing, cheating, deceiving other or being just, fair and sincere. 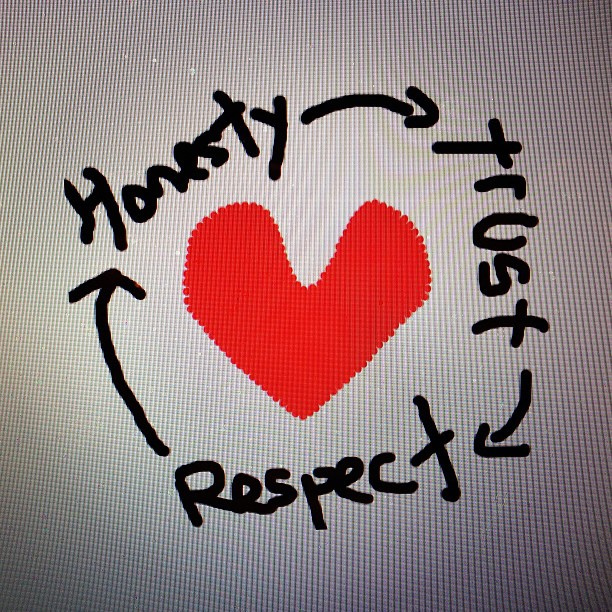 Accordingly, honesty is a core element to build the trust of someone. For instance, if someone feels that you are being honest and sincere with him or her, he or she will ultimately start trusting you and will take you into confidence. However, someone can still act honest and lie to you as well. Moreover, honesty also refers to being accurate or convincing in your opinions or facts. However, it does not emphasize that these facts should necessarily be the truth. We can see this highlighted in the justice system, especially in trial cases, etc. 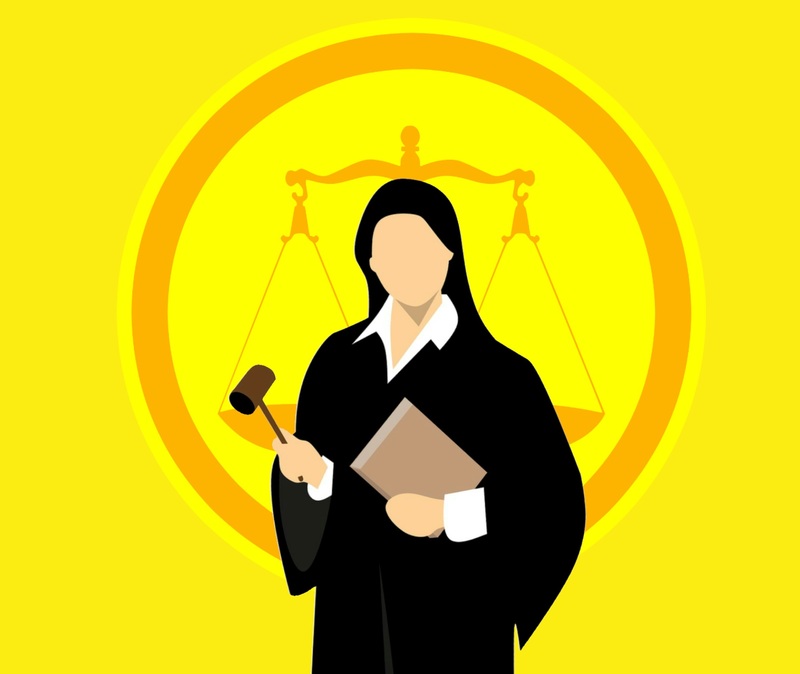 For instance, a lawyer can be honest; meaning he can present his facts convincingly and accurately in defending his client, but those do not necessarily have to be the truth since he has no obligation to actively present the truth (such as the whole story of his client). Thus, as long as he is able to provide good evidence and proper argument for his presentation of facts, you can account him to be acting honestly. However, it does not necessarily mean the justice system can always defend a criminal because the main aim of a trial is to unveil the truth someday or another. Even in a general sense, someone can still act honestly and tell almost everything about them while hiding the core lies. For example, your boyfriend or girlfriend can be honest with you by telling you everything they did in the day and still maybe thinking about someone else. Therefore, it is easy to fake honesty as well. Both truth and honesty are associated with the preciseness and precise presentation of certain facts to someone. Truth refers to a judgment, proposition, or idea that is true or accepted as true. On the other hand, honesty refers to the quality of being sincere and virtuous or the ability to present your facts convincingly and accurately; moreover, these facts do not necessarily need to be the truth. Thus, this explains the main difference between truth and honesty. 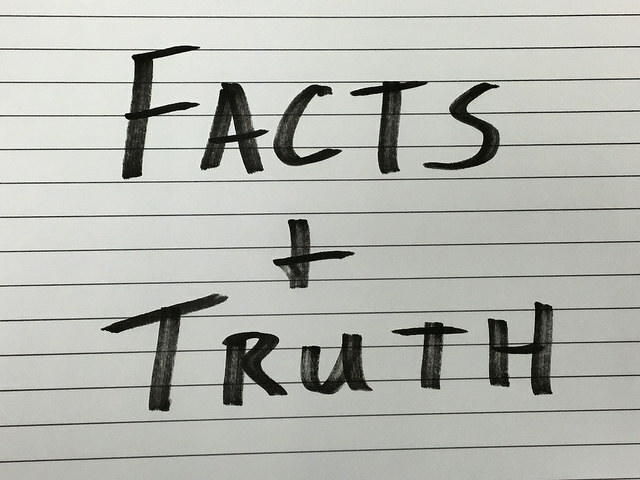 Another difference between truth and honesty is that truth refers to the quality of the facts or information while honesty refers to a human quality. 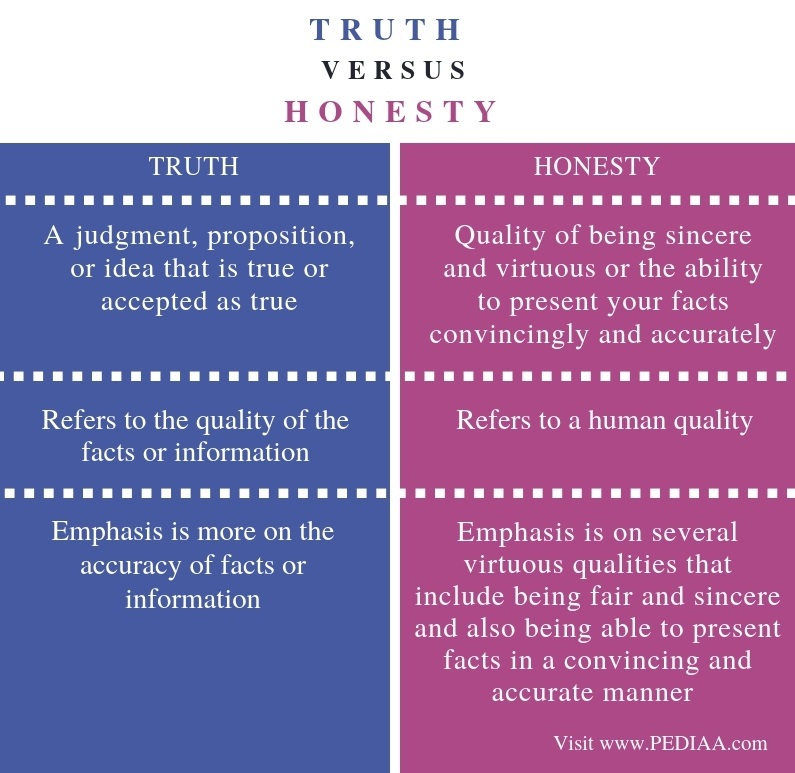 The emphasis in truth is more on the accuracy of facts or information whereas the emphasis in honesty is on several virtuous qualities that include being fair and sincere and also being able to present facts in a convincing and accurate manner to others. Hence, we can consider this also as a difference between truth and honesty. Truth lies in facts, yet it can be manipulated by the talent of lawyers; lawyers can be honest in their presentation but have no obligation to present the truth about his client. Hence, truth and honesty become two diverging facts in the legal stance. Thus, the legal focus leads another difference between truth and honesty. In a general sense, being truthful is similar to being honest. Nevertheless, with its application to various situations in life, these two seemingly similar concepts collide. 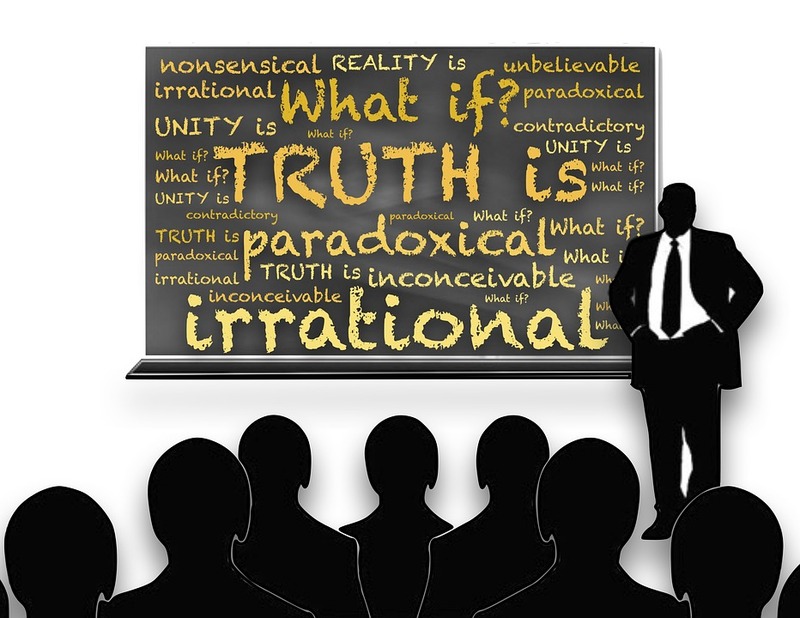 Therefore, the main difference between truth and honesty is that truth refers to the absolute reality of facts whereas honesty is a quality of being sincere and being able to represent ideas in an accurate, convincing manner. This is mainly seen in the trial cases in the justice system.